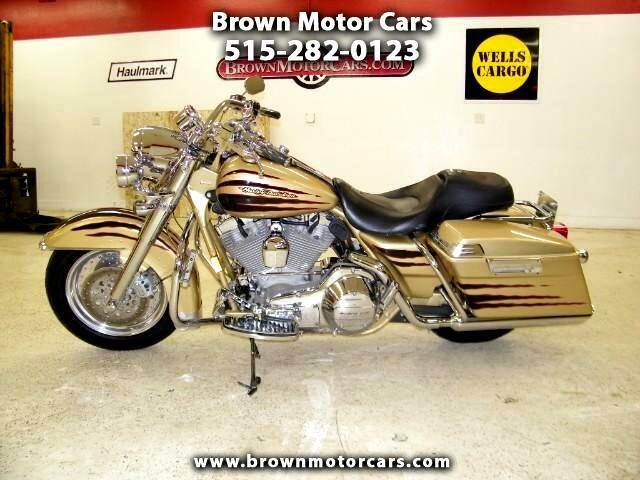 Thanks for looking at our 2003 Harley Davidson Road King Screamin Eagle Anniversary Edition! We just got this one in and it is a great looking bike with lots of goodies on it. For starters, this has the custom anniversary edition paint with the black flames that really sets this bike apart from all others! Than add that this is a screamin eagle with the 103ci motor and you have yourself one bad ride! It has lots of chrome extras including the custom grips, floor boards, crash bars with highway pegs, and also has the detachable windshield. This bike has had very good care and is ready to ride so give us a call with any questions or stop out and take a look for yourself.